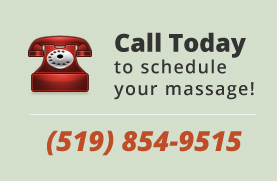 Contact Jenna Birtch, Registered Massage Therapists with any questions, comments or concerns you may have. We welcome your feedback and reply to inquiries in a timely manner. Now with two locations in London to serve you better! You may have noticed that different massage styles are popular at different times. And you may have wondered whether each was just part of a passing fad or the latest, greatest massage technique? Even more important is how can you tell whether the latest style will actually help you? Styles used in massage therapy range from long, smooth strokes to short, percussive strokes. Some massage therapists use oils and lotions; others do not. Before you can decide which massage style is best for you, you need to ask yourself a question. Do you simply want a massage for relaxation and stress control? Or do you need symptom relief or help with a certain health condition? Before booking a massage, let the therapist know what you’re looking for and ask which style the therapist uses. Many use more than one style. Or the therapist may customize your massage, depending on your age, condition, or any special needs or goals you have.